You'll start the process by cutting out your paper template. Use a couple pieces of double sided tape to hold the template on the foam while you trace the pattern pice with a Sharpie. 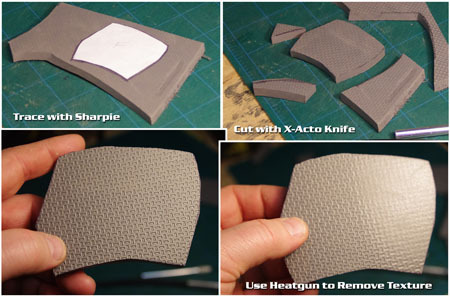 Use an X-Acto knife to cut the piece out of the foam. You'll need to change blades fairly often...the foam dulls the blades very quickly. 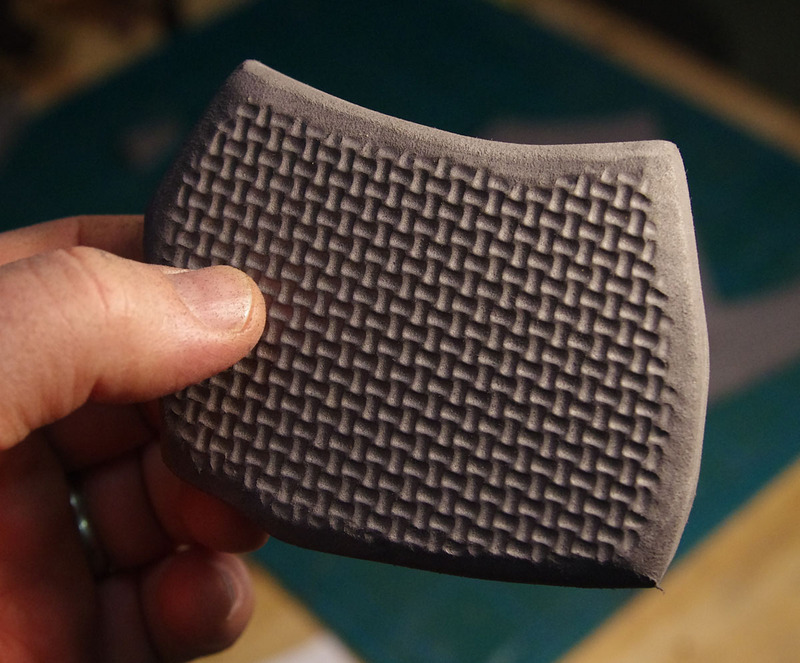 Now you'll need to remove the texture from the front of the piece. 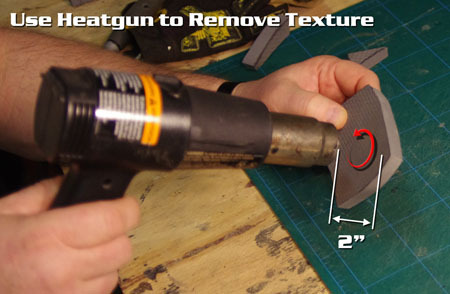 You do this by heating the face of the foam with the heatgun. 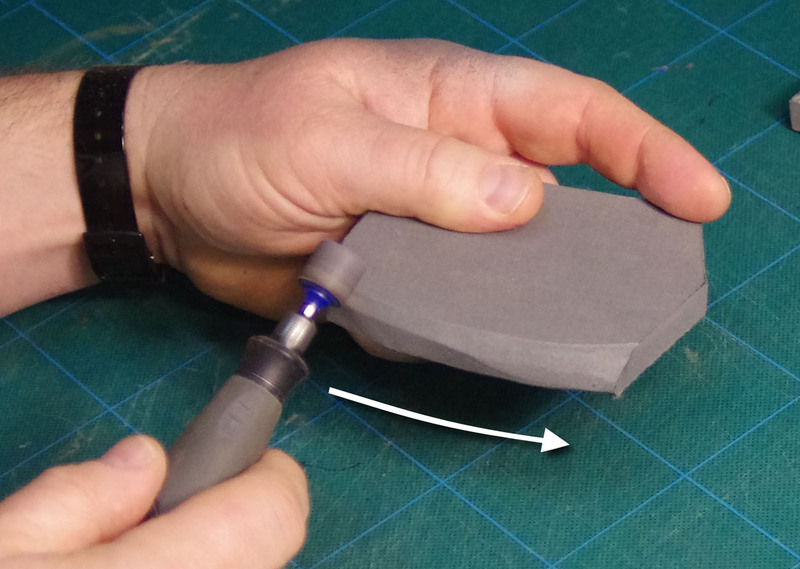 When you're removing the texture (or when heating the foam for shaping), make sure to keep the tip of the heatgun about 2" from the foam. Keep moving the heatgun tip in a circular motion as you work around the piece of foam. If you heat up one spot too much, it'll blister. 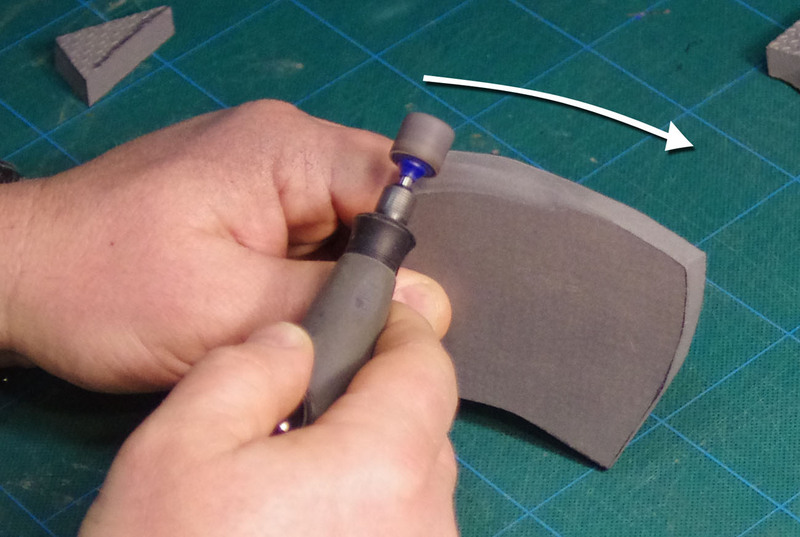 A new sanding drum is too abrasive for working with the eva foam. 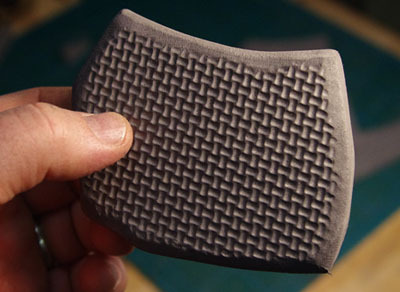 It'll grind off material too quickly, and leaves a striped texture from the grit on the drum. 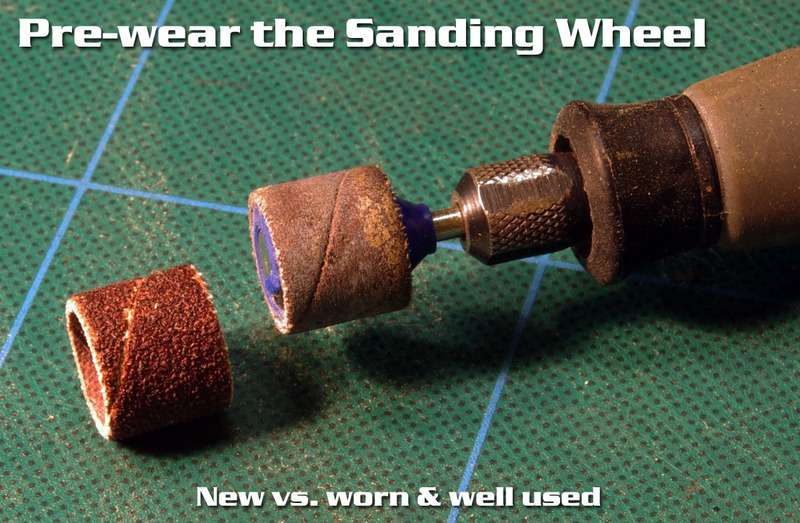 Before using a new sanding drum, I like to wear it out a bit first! I usually grind the new drum along the side of the disc on my bench grinder, but I'm sure you can use a grinding stone, concrete floor, etc. * Thanks to Volpin Props for this hint! Because of the rotation of the sanding drum, you'll want to grind from left to right. If you were to work from right to left, the drum will dig down into the foam & not float across the surface. Stop grinding before you get to the right edge of the piece. 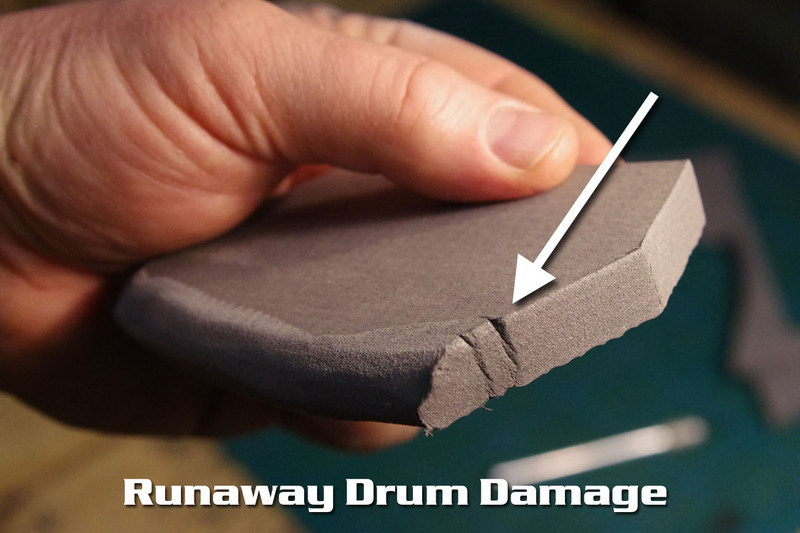 The rotation of the drum is bad about grabbing the foam & spinning around the edge of the piece. 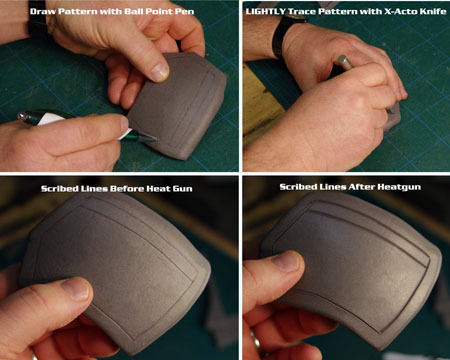 Just make sure to turn the piece of armor around & clean up the rest of the edge, working left to right. This is the damage caused by the bit running away from you at the end of an edge. As you can see, the damage isn't bad, but makes a little more work to clean up. You'll leave the glue/seam edges sharp, but if it's an exposed edge, I like to flip the piece over & grind off the edge of the back texture. That keeps you from seeing the back texture on the finished piece of armor. After you've finished shaping/grinding the piece, go back over the shaped areas with the heat gun. This will tighten & seal the foam texture. This gives you a much smoother surface when you get to painting the armor. Note: These pieces are made from two layers of foam that are glued together. You can just barely see the seam below the curve. I dremeled the texture from the backside to minimize the seam between the two layers. 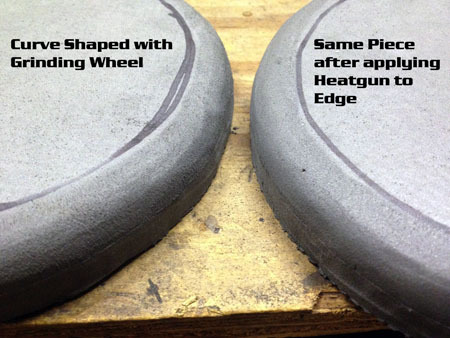 For shaping the foam, make sure to heat the foam from both side before you begin. 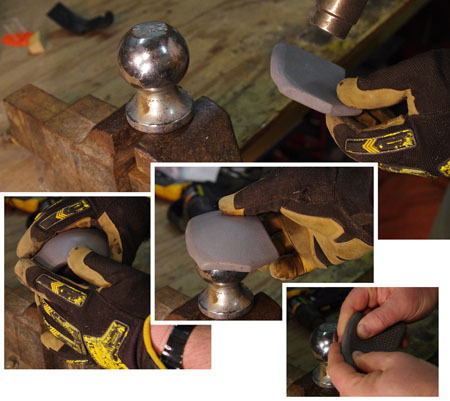 Once the foam is warm enough, you can use your knee, a hitchball clamped in a vise, or even just your hands to strech, form, & bend the foam. Hold it in the desired shape until it cools down. You can make panel/surface detail lines by first tracing the pattern with a ball point pen. LIGHTLY cut the lines with your X-Acto knife. Then just apply the Heatgun and the lines will open up!